A new website in beta right now could help people find what they want to watch on all available streaming applications. Leanflix was created by a quartet of people to help locate the exact type of film couch potatoes are interested in and where to view it. 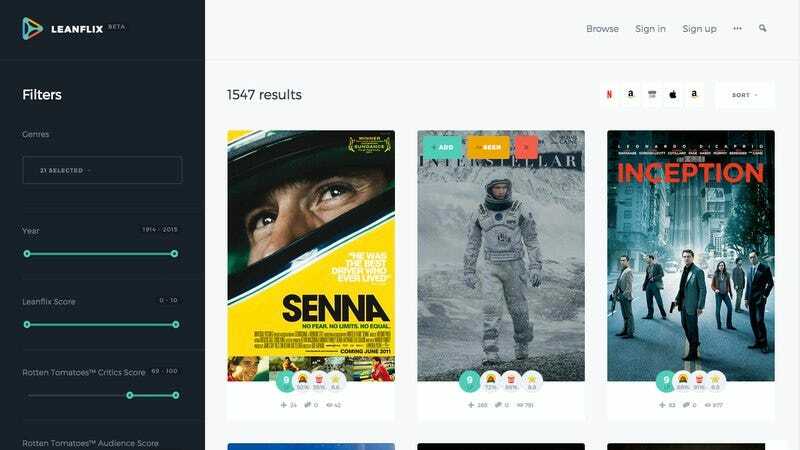 Users can set genre types, Rotten Tomatoes and IMDB ratings, years released, MPAA ratings, and a few other metrics to find something that piques their interest. Then the site looks at Amazon, iTunes, HBO Go, Netflix to see options for streaming, renting, or buying. These metrics help narrow down watching options in ways that no other streaming site offers, and would be great assets to all such platforms. The site is still taking new users’ suggestions and questions to improve, but for those looking for an R-rated ’80s horror film with a high Rotten Tomatoes audience score, Leanflix may just be the wave of the future.